Sheathed thermocouples with flattened measurement point (VMA/IMA) are needed, for instance, for the measurement of the temperature of pumps or housings or on test benches, namely wherever temperatures must be measured in gaps, on surfaces or at low installation heights. Typical applications are in mechanical engineering, the automotive industry and the research and development departments of universities and institutes. 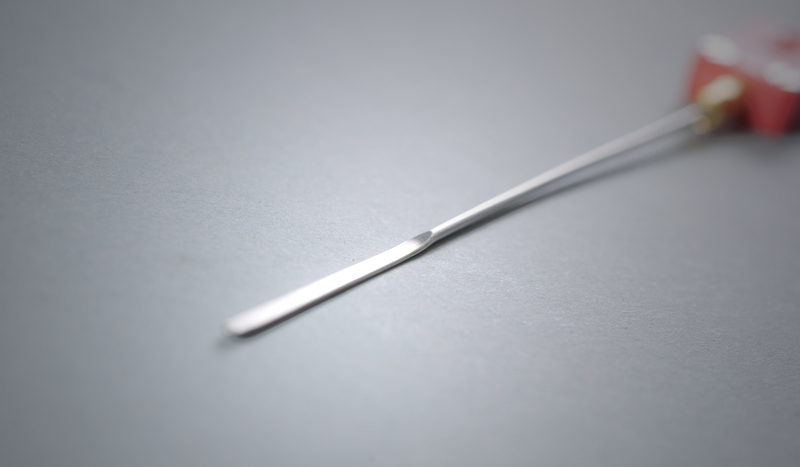 The tip of the thermocouple with the measurement point is flattened in several production steps so that the contact area of the thermocouple is enlarged. This makes fastening easier in the respective application, or it stabilizes the connection to a mechanical component. Of course, we also manufacture individual sheathed thermocouple with a flattened measurement point: the length and the material as well as the type of measurement point – e.g. sheath-welded or insulated – can be selected. Depending on the measurement application, we can also mount rings, eyelets or platelets on sheathed thermal elements.